I was sent a copy of this new book from Jonathan Stevens, Vegetable Growing, a money saving guide. This book is based on the 'cheery allotment blog' that Jonathan has been writing for many years now and starts from the start of his allotment journey when he took on a disused plot with his mother, Jan.
One of the first things that really pleased me about this book is that it is what I would call a good traditional 'how to' book. It is not full of flashy photographs, indeed it is overwhelmingly text. Whilst I enjoy a good photograph there is something really nice about a gardening book that focusses on what it is trying to tell you. The primary message is through the words. There are a few very charming line drawings in the book, but it is a book to read and absorb. The book discusses 'ten reasons why you should take an allotment', but also discusses why you need to consider it carefully. An allotment will take up time and you will have to commit to it. Jonathan discusses the value of online support and also reminds us that growing is meant to be fun. Yes you will save money on buying vegetables and yes the food will taste better be fresher and will be as organic as you want it to be, but I agree that you also enjoy growing it. A key part of any kind of gardening is the peace and relaxation that working hard in the garden can bring. Jonathan goes through the basic tools you will need and that they do not have to be new tools. A lot of allotmenting is about making do and recycling and this is clear in the book. Jonathan is urging us to save as much money as we can. Jonathan even set up a spreadsheet to chart his savings. The spreadsheet he created can be downloaded from his blog and he says he saved around £500 in his first year of growing. This is impressive. There is a growing guide for vegetables and a rather wonderful harvesting guide. If you are new to vegetable growing, or growing something you have not done before, knowing when it is ripe to harvest is not always as obvious as it may seem. Let's just say I once got confused by sweetcorn (don't judge me). There is also a useful 'allotment year' that goes through the year from when you need to buy your seeds (vital information) to checking stored crops. The more observant of my readers will have noticed by now that I do not have an allotment. Indeed I will go so far as to say I have no intention of having an allotment. I think this book is useful whether you have one or not as it is about growing vegetables efficiently and cheaply for the table. I learned a lot of good tips from reading it and even though I grow vegetables in my garden not an allotment, I cannot spend lots of money doing so. 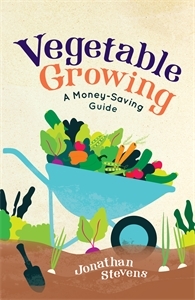 Vegetable Growing, a money saving guide is published by Michael O'Mara Books.